Prides themselves on the number of different types of aircraft in their hangar? Prefers GA or military aircraft to airliners? Likes to fly with the minimum amount of preparation? Congratulates themselves on never having to read the manuals? If you answered yes to any of the above, then the subject of this review may not be for you. Read on to check it out, by all means, but you need to be aware from the very beginning that Precision Simulator Ten is a simulation designed for professional pilots which needs to be flown in a professional manner (or else you most assuredly will experience the inevitable consequences). So (if you’re still reading) please allow me to begin by explaining the extent to which Precision Simulator Ten (or PSX, as it usually known) is distinctly different to any home simulator product that you have seen before. 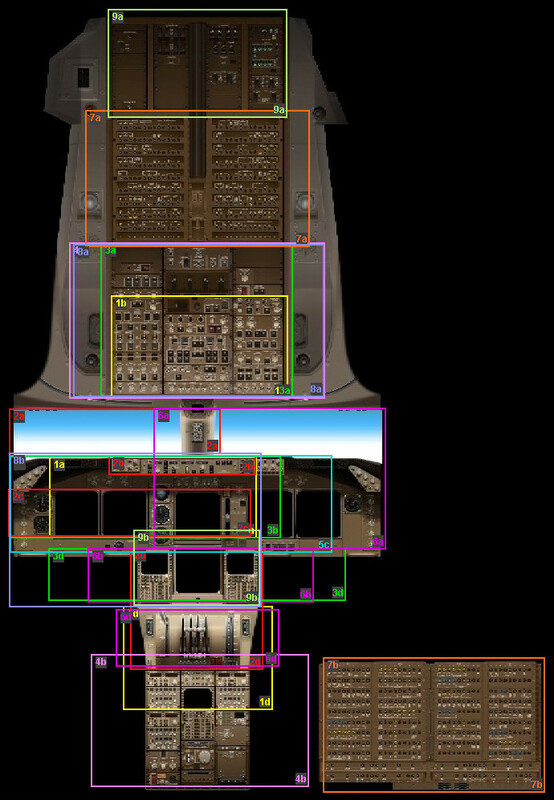 The first thing to understand is that PSX simulates the Boeing 747-400 (or 744, for short) in amazing and minute detail. It comes complete with many different configurations of the 744 for different airlines, including both ER and non-ER versions, passenger and freight, but it focuses closely and solely on individual models of the Boeing 744 — you can’t fly any other aircraft with it. The second point to make at the outset is that PSX isn’t primarily a product for simmers at all (although it does support an extremely active group of hard-core simmers — including many real world 747 pilots — on its forum, as we shall see). (most pictures enlarge when clicked) In the words of its creator: “Precision Simulator is a stand-alone flight & systems trainer for professionals — and for everyone interested in professional operations”. However, a glance down the extensive list of customers for the previous version (see http://aerowinx.com/html/pro.html ) makes it clear that its main customers are Aircrew Training establishments, as well as universities and a sprinkling of other organisations such as NASA, ARINC, and so on. But nonetheless, one could also add serious simmers to the list, and indeed some very serious simmers indeed such as Matt Sheil ( http://www.hyway.com.au/747/747.php ) — his current sim is pictured, left — have been using PSX’s predecessor to drive their cockpits for over fifteen years, and are enthusiastically moving over to the new version as I write this. Many people would probably describe Matt as a cockpit builder rather than a simmer (his cockpit is even mounted on hydraulic jacks for full motion), and indeed PSX is a cockpit builder’s dream, for reasons which I’ll come to soon. Another thing to notice in the above picture is the presence of an Instructor Station, which can be seen on the left, behind, and well out of sight of, the pilots. This, of course, is normally a feature of an FFS (a Full Flight Simulator on a motion platform, used for aircrew training), but it is central to the PSX philosophy. I’ll have more to say about that aspect later on, too. And I suppose the third point to make is that PSX isn’t any kind of add-on for FSX (or X-Plane or P3D or anything else, for that matter. So you might say goodbye to FSX and all its attendant problems). PSX simulates a Boeing 747-400 aircraft in comprehensive, almost obsessive detail: every light bulb in every switch is modelled (or both of them if a switch contains two bulbs, with the result that it will become dimmer if just one fails), as are the 400+ circuit breakers in the cockpit, which can be pulled and/or collared as in the real thing. It goes without saying that the aerodynamic model is superb (hand-flying it is a joy). You also become very aware of the inertia of this huge aircraft, so that after rolling her 400 tonnes onto a new heading, for example, it is necessary to apply a touch of opposite aileron at the end of the turn — as in the real aircraft (as I have been told by a former 747 pilot). ● An unbelievably complete and detailed simulation of the Boeing 747-400, with a huge range of equipment options (which you can readily configure). 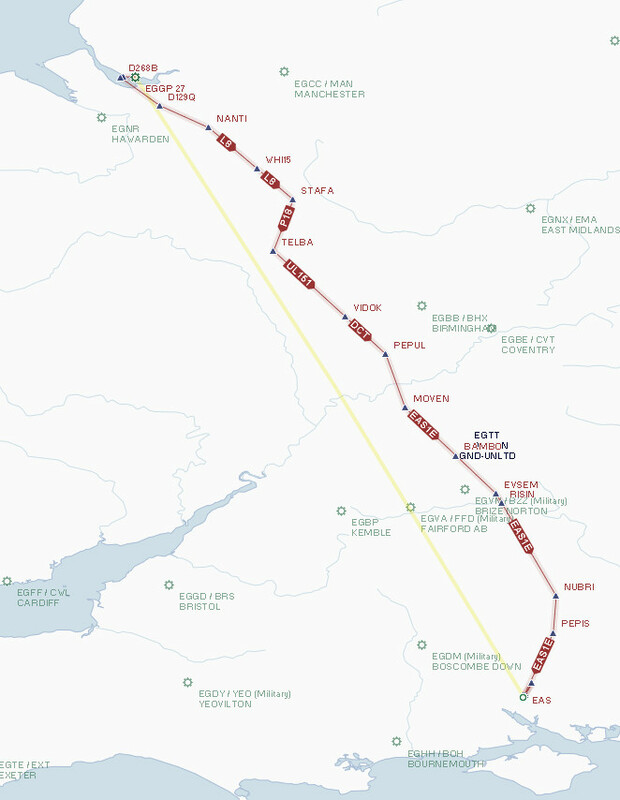 both NDs — a take-off from Trondheim is shown below). Weather radar with tilt and gain selectors is built in too, of course. ● Configurable traffic for TCAS training. ● A comprehensive ACARS and despatch system. ● Simulated ATC (including CPDLC). ● Every switch and dial works, and does what it would do on that model of 744.
that you could wish for (see above). In summary, PSX is an absolutely superb procedural trainer for the Boeing 744. I mentioned previously the knowledgeable and lively forum, but may I stress that I mean “lively” in the sense of “active and interesting” (http://aerowinx.com/forum/forum.php?id=1 ), and certainly not lively in the manner of certain bellicose FS forums that we all know and prefer to avoid! As you can see, if by any chance you do find PSX’s built-in visuals a little minimalist for your taste, you can readily use FSX, P3D, X-Plane, or Google Earth to give you a more detailed and colourful outside view — I will undertake an example flight at the end of this review. The other (and all of these are free, remember) utilities are also very useful: for example, since the flight deck printer in PSX actually works, I use AdaptPSX to print the output to hard copy. The app also interfaces my Aerosoft Australia hardware MCP, so that if I wish to change my heading, for example, I turn a real knob rather than an onscreen virtual one (and AdaptPSX has other useful talents, too). 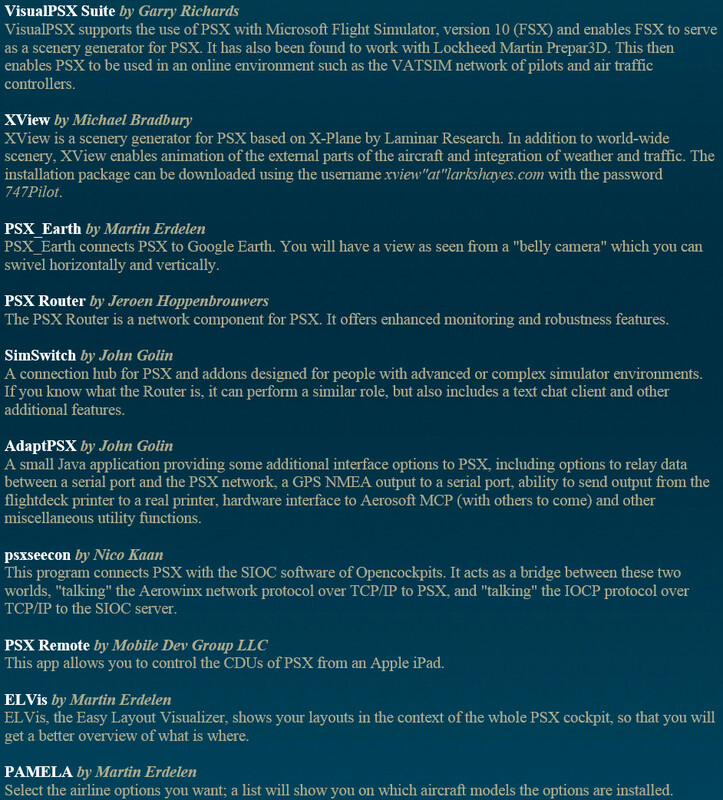 There is also a growing list of tutorials, including a 64-page “Getting started with PSX” pdf document aimed at getting you flying as quickly with PSX as possible (the next in the series, covering the specifics of flight planning using PFPX and TOPCAT with PSX, is also online), and you can find those on the Miscellaneous page of the Aerowinx site ( http://aerowinx.com/html/misc.html ). One of the inevitable results of its focus on professional flight training is that simmers will very quickly encounter various features that they have never seen simulated before, so a fascinating learning curve results. This is a process which naturally delights the dedicated procedural simmers — and let’s face it, most people who buy this product will come into that category. As an example of the features you may not have seen before — all three ACPs (Audio Control Panels) are fully functional, so that if you wish to hear ATC, or marker tones, or ATIS, or whatever, you have to learn how to configure your ACP to enable you to do so. PSX comes with many varieties of what it refers to as its ‘human simulations’, which “...interact as ATC (voice and CPDLC), cabin crew (interphone system demo), ground crew (towing), air traffic (TCAS), PNF (checklists, calls, silent tasks), and ATIS” (to quote from the sumptuous 600-page colour manual that comes with the product). Incidentally, you can download a 397-page preview version of that manual from a link on the main Aerowinx introduction page at http://aerowinx.com/index.html . 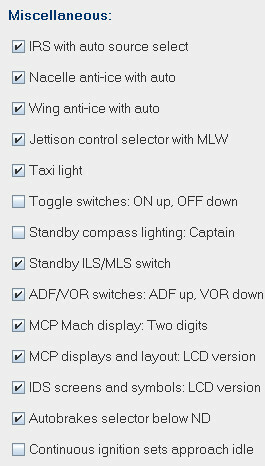 In the above list you may have noticed a reference to CPDLC, and you will find that the ACARS system is also modelled. So don’t try flying PSX without sound, since you need it for ACARS chimes; not to mention PNF callouts, EGPWS, pushback, and ATC, as well as the familiar bell, wailer, siren, beeper, and much more. The PNF’s callouts are configured according to whichever airline’s model of the 744 you are currently flying, naturally; and the PNF can assist you by performing some routine “silent tasks” to lighten your workload (although you can, if you wish, prevent her or him from doing so). 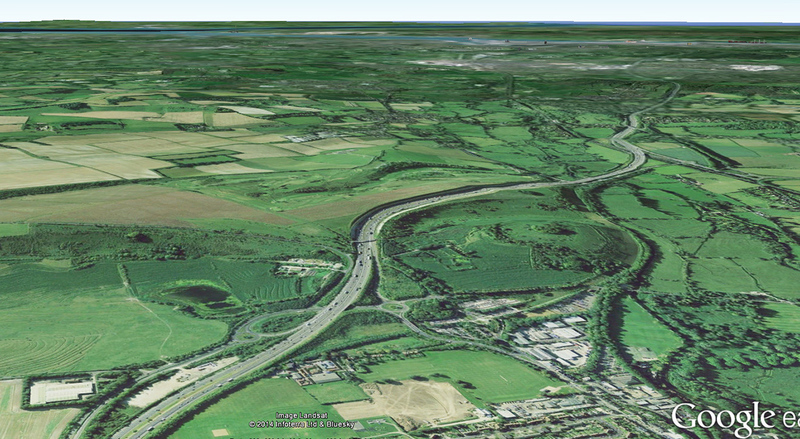 You will also be grateful for the inclusion of EGPWS terrain contour maps on the Navigation Display (ND). But I’ll restrain myself and pause what would be a very long list: hopefully, you will by now have gained an impression of the range of PSX’s capabilities, and how much more advanced it is than anything else available to the home simmer. It’s therefore time for me to delve into a little more detail of a few aspects of this amazing simulation. 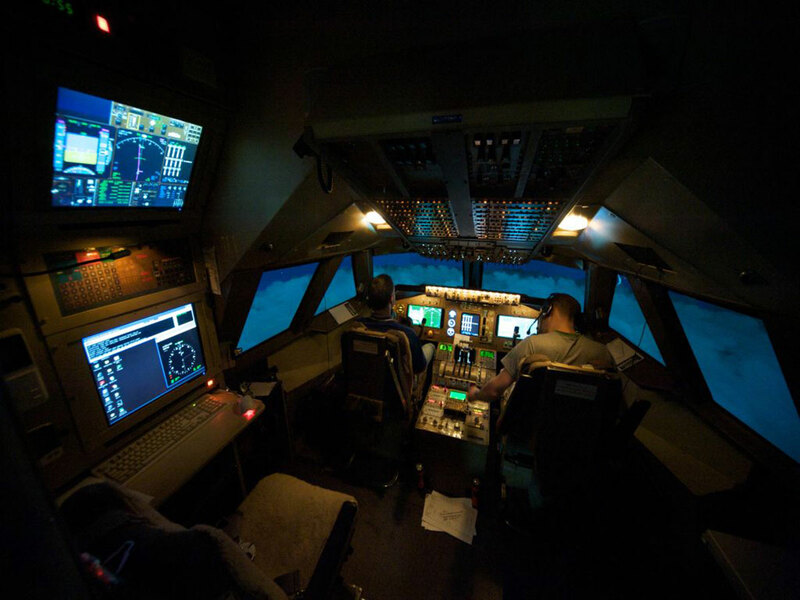 In a Full Flight Simulator (FFS), the pilot is usually being monitored by someone in the Instructor Station. That person not only sets up the scenario which the pilot is about to fly, but has complete control over the entire environment — not only every aspect (and failure point) of the aircraft itself, but also the external environment in terms of weather, position, and so on. Most home simulators are by definition a one-person affair, so an Instructor Station would be something of a luxury. But once again, PSX is different — here, the Instructor Station is a fully integrated part of the sim. PSX is designed from the ground up for cockpit builders, and hence its networking capabilities are extensive. As a result, it’s straightforward to arrange for one person to be flying PSX in, say, London, with another manning the Instructor Station in ... well, anywhere you like, really, via the Internet. Additionally, you can start multiple instances of PSX on the same machine if you wish (perhaps to drive individual display screens; and add-on utilities such as VisualPSX and AdaptPSX run as clients to a PSX server), or else you might choose to have the additional PSX instances running on other computers and networked to a single PSX master instance. The choice is yours. PSX’s graphical facilities also offer the utmost in flexibility. Each PSX display screen can be further divided into two, three, or four subscreens; and each subscreen can be panned and zoomed to show any part of the cockpit environment. Furthermore, you can switch instantly between nine such layouts with a single keystroke or button press. So the way you choose to display the cockpit environment on your screen(s) (or virtual screen(s)) is totally customizable. For example, I have a virtual screen of 5760x1200 pixels, so I normally choose to display PSX in nine layouts of 3840x1200 px, and use the remaining 1920x1200 for other things — the Instructor Station, perhaps an outside view via Google Earth or FSX, charts, and other supporting stuff. But you arrange it as you wish; the only limit is your imagination (and the contents of the virtual cockpit, of course). You could, for example, have an instance of PSX running solely to display the PFD or ND on just one of your cockpit screens. 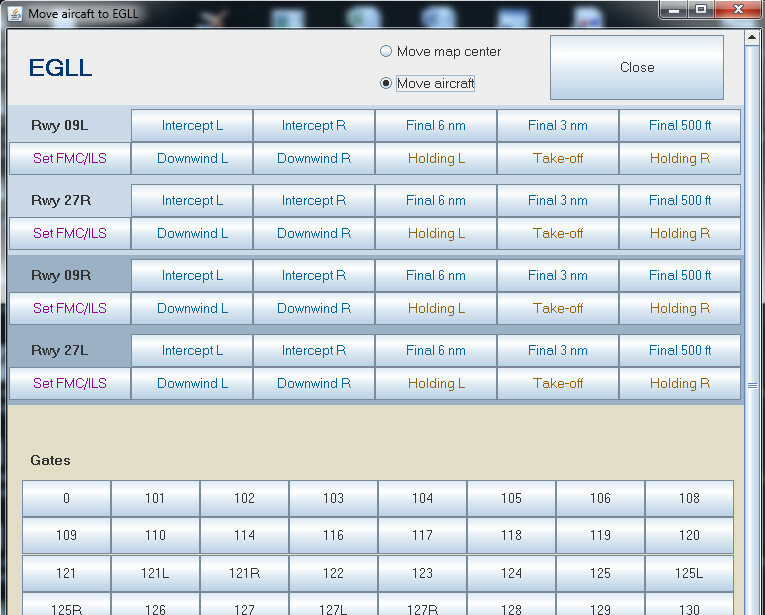 The layouts are defined in the Layout tab on the Instructor station (more about that later). But PSX is even more versatile than I have mentioned so far. It is not limited to Windows — yes, you read that correctly, it will run on anything (Windows, Mac, full implementations of Unix or Linux, you name it) that supports Java 1.6, 1.7, or above, whilst also making full use of any available graphics acceleration hardware. That does mean that some tablets will be unable to run it since they don’t possess a full Java implementation, but otherwise all you need to do to get PSX running on a different Operating System is to copy the installation directory from one machine to the other. Many people run PSX on networked machines using a mixture of O/Ss, and it works flawlessly. Mac-only setups are common. Having started to say something about the Instructor Station, I became diverted whilst explaining just how flexible PSX is. But we do need to briefly take a closer look at the Instructor Station, since it controls every aspect of the experience that PSX brings to the pilot. 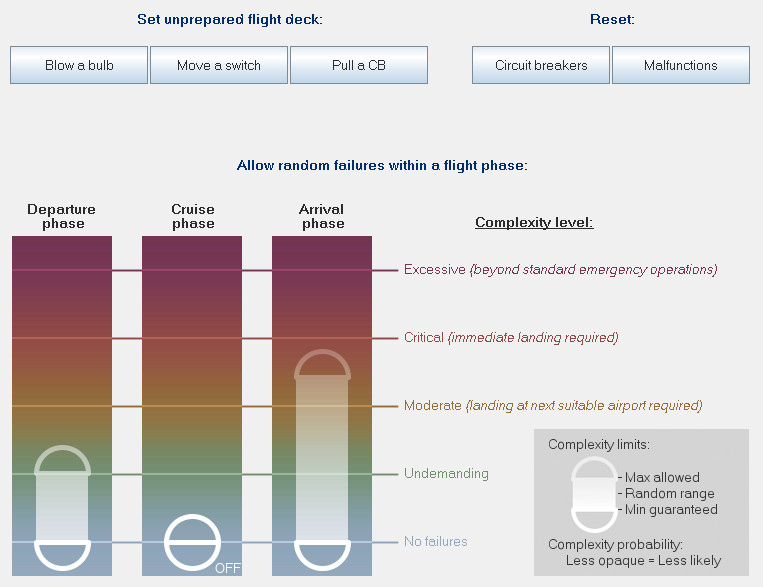 As a simmer, though, if you use malfunctions (which I strongly recommend) you will probably use the “General” malfunctions page most often (illustrated right): as you can see, this enables you to set up ranges of malfunction probabilities for each phase of the flight — and also to set random problems for you to find during the cockpit preparation, too. The other page that simmers regularly use is the “self-induced” page, where you can set up very specific scenarios that you wish to practice. As you can see (right), this is serious stuff (as you would expect, since it was included for flight training purposes) but simmers who take their flight simulations seriously have never before (OK, with the possible exception of PSX’s predecessor PS1, which was released 15 years ago) had the opportunity to practice exactly the same drills that professional pilots are subjected to in the “sweat box”. And if you think that those two pages are testing, wait until you see the other nine (yes nine!) pages of malfunctions that the Instructor can deploy to impose specific forms of failure! There are far too many individual malfunctions to list, but simply the names of the nine pages will give you some idea of the range of horrors that might be visited upon the poor pilot from the Instructor Station: Airframe, Alerts, Bleed, Elec, Engines, Fire, Fuel, Hyd, and Nav. (Be afraid, be very afraid...). And as you can see in the picture below, you can additionally pre-program each failure in many different ways. (Incidentally, when I commented just now that I strongly recommend you to use malfunctions it’s not because I’m some sort of sadist (or masochist, either), it’s simply that I believe that flying with zero possibility of anything going wrong is not only unrealistic, it’s quite frankly somewhat boring. As I tend to put it, it’s a bit like playing backgammon without using the doubling cube: a different, and certainly a very much tamer and considerably blander, affair altogether). But if the detailed simulation of malfunctions doesn’t appeal to you, you can (if you insist) quite simply switch them all off until such time as you know enough about the 744 to be able to deal with them. Believe me, this simulation has bucket-loads of other goodies for you to explore. I’ll have to confine myself to the most often-used parts of the Instructor Station, or else this review will be even longer than is already the case. So I will skip over the Model tab (where you can select a very specific real-world 744 model to fly); the Analysis tab (which gives you huge amounts of information about the airports and navaids in your flight plan); and the Network tab (where you configure the role of this specific instance of PSX within your environment — the EULA allows you to run up to four instances of PSX simultaneously in a home cockpit setup); and move on to the more frequently used options. Let’s start with the Preferences tab. Here, you configure how the simulator starts up, find the IP address to use for this instance whilst networking, set the frame rate limit (usually to the maximum 72 fps, which are routinely achievable, even on a laptop), select the audio sounds, and configure the USB hardware controls. Nothing earth-shaking — apart from the fact that it all works, flawlessly. This may perhaps be another digression, but I have to say it somewhere, and here is probably as good as anywhere else: PSX will be a revelation to those who are inured to FSX with its long startup times, its shaky support for saving the current sim situation, its stuttering graphics, its problems with memory.... we know all those scenarios only too well. But PSX just works. It starts up in about five seconds on my machine, and if you save a cockpit Situation and later go back to it, you get back to exactly where you were, every time. It is rock solid from the stability point of view (forget about restarting it, let alone rebooting — the need will never arise). Which caused one happy user to write, on the Aerowinx forum: “The biggest difference is simply this: PSX you install and start flying immediately. Everything else you install and start troubleshooting immediately”. The next familiar tab in the Instructor station is the Layout tab, which has been mentioned above. You can define and store as many “9packs” as you like — as the name suggests, these are groups of nine layouts, each of which can consist of one, two, three or four subframes. 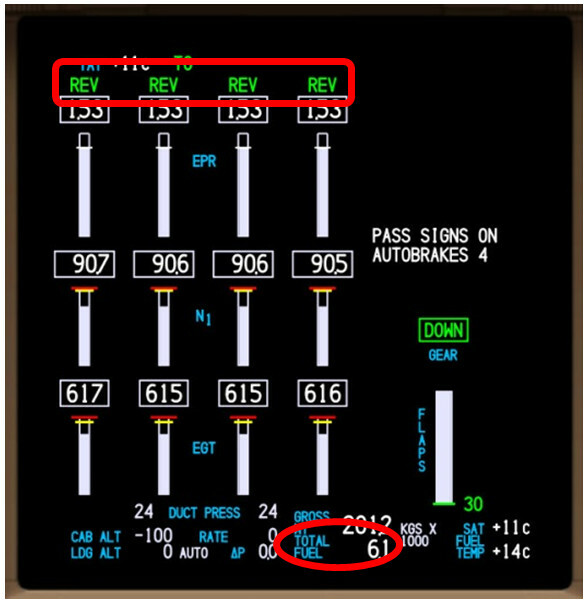 Using another free utility (this one is called ELVis — see the list, above), you can review your set of “flightdeck frames” to ensure that you have the whole cockpit covered, as the example (left) shows. There may be those who are a little surprised to find that a simulation as advanced as PSX uses so-called “2D” panels rather than some variation on the “virtual cockpit” theme. But once again, the intention is very deliberate, and the trade-offs have all been carefully considered and calculated. The fact is that for real world training you need the Primary Flight Display (PFD) to be as large as possible, positioned in the centre of the monitor, and in line with the aircraft heading in the windshield — which is easily achievable thanks to PSX’s innovative layout technology. On the other hand, if you are a cockpit builder who wants to display just the ND (for example) on a single monitor, that’s easy to do, as well. A 3D picture of the cockpit on a 2D monitor screen is far from being optimal for instrument training, since the representation of the instruments then becomes way too small for professionals to use. OK, for VFR purposes, the physical location of the panels can be quickly absorbed, but for IFR the flexible PSX approach possesses many advantages that old-fashioned “virtual cockpits” do not — along with the huge advantage that the primary instruments can be made sufficiently large so that even tiny movements can be seen and responded to before they can become significant (no one wants 400 tonnes of jet to be anything other than under complete control at all times). Tempting though it would be to review many more of the sub-tabs of the Instructor station, I must press on. If you would like to know more, then may I suggest that you could download the generous “taster” version of the PSX manual from the URL I gave above, and review the details given there. Hopefully, I have now said enough to sketch out for you some of the mouth-watering goodies on offer from PSX, but as simmers the real question we all want answered is — how does it fly? The answer is, superbly. Although PSX was written by one man (no one told him it was impossible, so he just went ahead and did it) he has also had access to the Precision Simulator community, and many of us have been following the development closely since the days before its predecessor, PS1, was released, 15 years ago. So whilst there are a number of very experienced simmers on the forum, the professional market for PSX means there are probably even more aviation professionals there, many of whom have contributed their specialist skills during the development process as part of the beta team. Not only real-world 744 pilots (as well as pilots of other airliner types), but also engineers, dispatchers, ATCOs, and specialists in other aviation disciplines have all been involved to a greater or lesser degree, with the result that the PSX experience is outstanding, rich, and in-depth. Or, as another recent purchaser delightedly described it — “There are no placebo switches”: every knob, every switch, (and yes — every circuit breaker), all are modelled, and all have the effect that a professional 744 pilot would expect. This is not just a heavy Cessna that tries to simulate a few of the FMC functions and has, well, quite a lot of the switches working (no reference to any specific simulated 744 model intended, of course) — PSX is the most complete simulation of the real aircraft that has ever been available for the home simming market. Each of those aircraft comes with the exact configuration of its real-world counterpart (you can use PAMELA, another free PSX add-on, to choose between them, based on the specification you’re looking for). However, if you’re not concerned about faithfully simulating a particular real-world model, you can use the Instructor pages to configure your own, choosing between Combi / Freighter / Passenger / Freighter Extended Range (ER) / and Passenger Extended Range (ER) models, with GE, PW or RR engines (no less than three pages of options await your attention within the Instructor Station to choose from — see the partial example, right). So no shortcuts, no “placebo switches”, just 100% full-fat flight simulation in mind-boggling detail. Hence my suggestion at the start of this review that unless you’re someone who enjoys simulation in depth, PSX will probably not be to your taste. On the other hand, if you are the sort of person who enjoys getting all the details absolutely right, you may think you’re in heaven. (Did I just hear a ghostly whisper.... something about “As real as it gets”? Nah, silly of me). Anyway, permit me to conclude by briefly describing a flight with PSX. I’ll be using AdaptPSX (although you won’t really notice that) and also VisualPSX or PSX_Earth to generate some additional eye-candy, which is especially useful when taxying between the runway and the gate. Using VisualPSX does mean, of course, that I’m going to have to fire up FSX to act as the scenery generator. I could have opted to use Google Earth or X-Plane for the same purpose (in which case I’d be using PSX_Earth or XView instead of VisualPSX), but I have spent a lot (more than the purchase price of PSX, I have to admit) on FSX scenery over the years, so it seems a shame to waste it, and VisualPSX will enable me to see it again. But VisualPSX does require FSX as the scenery generator, and that is expensive not only in terms of start-up time and all the other ills that FSX is heir to, but notably in the amount of CPU it will consume, dragging down the PSX performance on my machine. One final comment: since my screens are arranged side-by-side I will be running the eye-candy screen at 1920x1200 px, and PSX itself at 3840x1200 px. Both those sizes of graphic output are considerably reduced in quality when shrunk down to a size suitable to include here, I’m afraid, so unfortunately the awe-inspiring quality of the resolution is something you’re going to have to mostly take my word for. I have recently been carrying out some experiments with PSX on short runs between airports with relatively short runways (long haul trips may be the norm for 744s, but nonetheless they often do short trips as well, and perfectly happily), and so in this case I will be taking off from Liverpool (EGGP rwy 27, TORA 7,497 ft), cruising briefly at FL230, and landing at Southampton (Mutley-land — rwy 20, LDA 5,266 ft). Obviously, I have very few passengers on board and have loaded very little fuel for this trip, so I will have no problem in taking off (unsurprisingly given those four huge engines, my rate of climb will be quite startling — and before anyone asks YES, that would be entirely normal for a 747 in such a relatively unusual situation), and I will then land at Southampton and aim to slow down in time to be able to comfortably take exit A1 from the runway and taxy in. 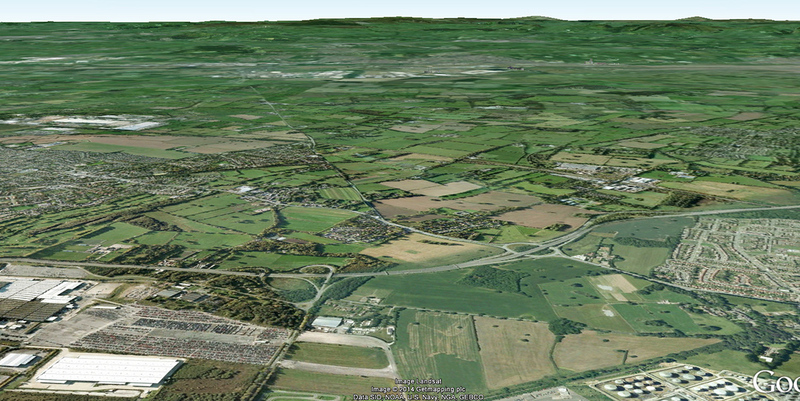 I did the trip twice, once using VisualPSX with FSX (and also Aivlasoft EFB running on a networked machine), and then again for comparison purposes using PSX_Earth — so no FSX that time, just the view from the Google Earth plug-in running in a browser. Pictures from both utilities will follow. I will skip over the whole routine of starting up and taxying from the gate. PSX handles it all superbly, of course, although don’t expect a pushback to GSX standards, the mechanism supplied is simply to enable you to do so with reasonable authenticity — see the PSX manual under Instructor | Situation | Service for full details of the way to achieve this, and the voice responses you will receive. (A similar consideration applies to the PSX ATC, incidentally: this is not meant to be a fully featured and flexible representation of ATC — although well implemented with a variety of voices in different parts of the world, it is intended for flight training, and hence it will get you there, but is provided more as a distraction than as a helpful Air Traffic Control service. Which, of course, is entirely consistent with the PSX training philosophy. And if you are using ATC you will have to use the Audio Control Panel and the relevant radios (yes, including HF where applicable) to be able to hear them). I should mention also at this point that PSX has its own in-built checklists. Of course. And your First Officer chats away to you quite happily, as well as carrying out helpful “silent tasks” (but only if you wish, as mentioned above). So you are unlikely to feel lonely during the time before reaching the runway threshold. But let’s get back to taxying. 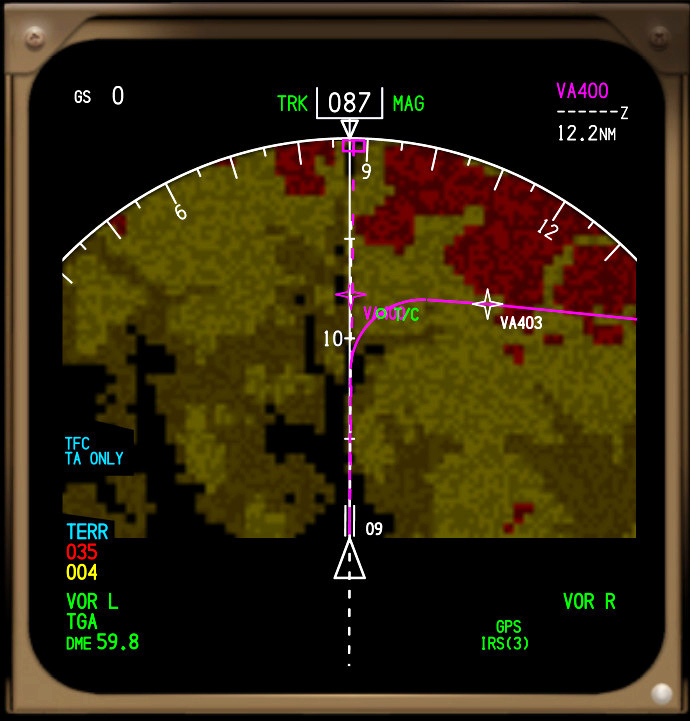 PSX’s own minimal out-of-the window view provides all that is required for runways, weather, and horizons, but taxyways are not included — hence the possible need for the dedicated home simmer to deploy some form of additional graphical eye-candy whilst taxying if they want to fully simulate the complete flight experience. The requirement for additional eye-candy between take-off and landing is, however, a matter of opinion, and several professional pilots on the Aerowinx forum have stated that they frankly prefer the PSX frame-rate-friendly implementation to anything from another source. Perhaps it’s simply that the professionals don’t gawp out of the window as much as we simmers do — but, as always with your own sim, the choice is yours. Notice two things immediately: the first is that it’s raining, which PSX has picked up from the METAR and injected into FSX via VisualPSX. The version of VisualPSX in use when this review was being written suffered from a slight problem whereby the weather intermittently reverted to being another boringly beautiful day in California — but that problem has since been fixed (in build 5404). It’s not raining here, because Google Earth doesn’t reflect current conditions, only the conditions when its photos were originally taken. Similarly, once we take off you will find that the PSX_Earth view doesn’t bank during the turns, since the view is simply the one you would see from the point in space currently occupied by the aircraft. But as I said above, the biggest difference experienced between the two utilities is undoubtedly the PSX frame rates. With FSX (that well-known CPU-hog) alongside VisualPSX, my PSX frame rate was mostly around 48 fps, although when complex things were happening it occasionally dropped quite a bit lower. With PSX_Earth running in a browser (and hence no FSX), PSX had no difficulty whatsoever in maintaining 72 fps at all times. Whilst I had VisualPSX (hence FSX) running alongside PSX, I also started up Aivlasoft EFB on a second machine. 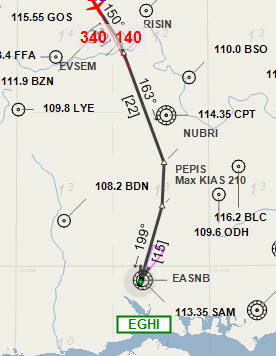 I had previously planned the route in PFPX (see picture) and exported it to both PSX and EFB, so this was easy to do. At present, the EFB option won’t be available without FSX (i.e. when using PSX_Earth, in this case): happily, however, v2 of Aivlasoft EFB is scheduled to accept input directly from PSX without the need for FSX, so that will change, in time. But this is a review of PSX and not the add-ons, so I’ll say no more about the utilities, although I will use them again to show you a few more screen shots here and there. PSX offers a wide variety of options for controlling your virtual 744. Leaving aside the “Q-codes” which enable cockpit builders to interface a variety of cards (see the “Networkers” forum on the Aerowinx site for more details about Q-codes: http://aerowinx.com/forum/forum.php?id=4 ), you can use either the mouse, USB devices (yokes, throttles, etc. ), or a plethora of keyboard options. If, like me, you prefer to avoid the keyboard, then simply use a shareware utility such as JoyToKey to convert the buttons on your USB devices into keystrokes that are understood natively by PSX. ● Press the F8 key once. ● Press the USB button that you configured for the speedbrake EXT once. ● Or simply drag the speedbrake lever with the mouse until the mouse icon turns orange and says "ARMED". That’s as well as using Q-codes or else assigning one of your hardware buttons using JoyToKey, of course. So all in all, there is no shortage of available control options! Just as FSX has the ability to save and load “flights”, PSX has what it terms “Situation files”, or situs, for short. The difference here is that unlike FSX, PSX is entirely unfussed about returning the sim to the exact moment when the situ was saved, and never becomes confused. When you install PSX it comes with a large number of situ files (right up to and including an encounter with volcanic ash, departure and approach to St. Maarten, clear air turbulence, localizer back course approach, step climb, overflying the North pole, even a landing at Zurich with all four engines out) and you can easily create your own. (Incidentally, I didn’t say anything about the PSX installation process for the simple reason that it works perfectly, does its job in a couple of minutes, and that’s all there is to say: I have never heard of anyone having the slightest problem with it). You can also configure PSX to save the current situation at the press of the EVENT RCD button just above the primary EICAS display, which can be extremely useful when you find yourself attempting a tricky landing which you might possibly want — or perhaps need — to try again. So when it comes to getting yourself ready for the trip you can select any situation you like — although you will usually choose from one of the basics: cold and dark; on ground with IRSs aligned; on ground and doors closing; on ground and cleared for engine start; or cleared for take-off. You will then need to position the aircraft, of course (which is made exceptionally easy, as these pictures show), and as mentioned above PSX has every runway in the world which is longer than 4,600 ft / 1400m in its database. You also need to plan your trip; and you have the choice of either using PFPX and TOPCAT (PSX reads PFPX’s .route files natively, and you can configure PFPX to export its route to PSX for you) or else getting a route from your favourite Internet or standalone source and typing it into the RTE page on the CDU in the usual way. Bearing in mind the above discussion about taxying from the gate, quite how you choose to arrive at the runway threshold is up to you, but once there (having completed the requisite checklists and received ATC clearance) it’s time to take off. 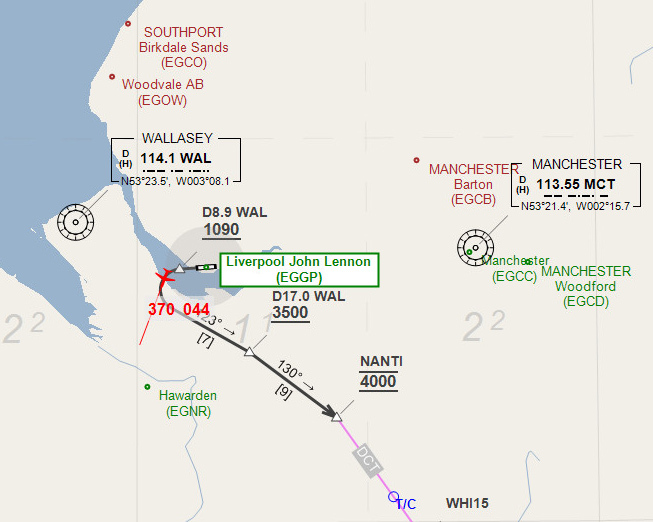 So back on rwy 27 at Liverpool (the representation in Aivlasoft EFB is shown, left) we push the throttles forward, and once the engines are stabilised press the TO/GA button (the virtual F/O confirms “Takeoff power set”). Being fairly lightly loaded, and also with only 12 tonnes of fuel on board, there won’t be any question of ending up in the Mersey. Sure enough, the “Rotate” call comes with a reasonable amount of runway to spare, and so we gently raise the nose and follow the Flight Director and then raise the gear (I engaged the autopilot at around 500 feet on this occasion to give me more time to take some pictures to show you here), and then start to raise the flaps in accordance with the schedule on the airspeed indicator tape. Whilst we’re climbing to cruise altitude, let me briefly describe another of PSX’s features. 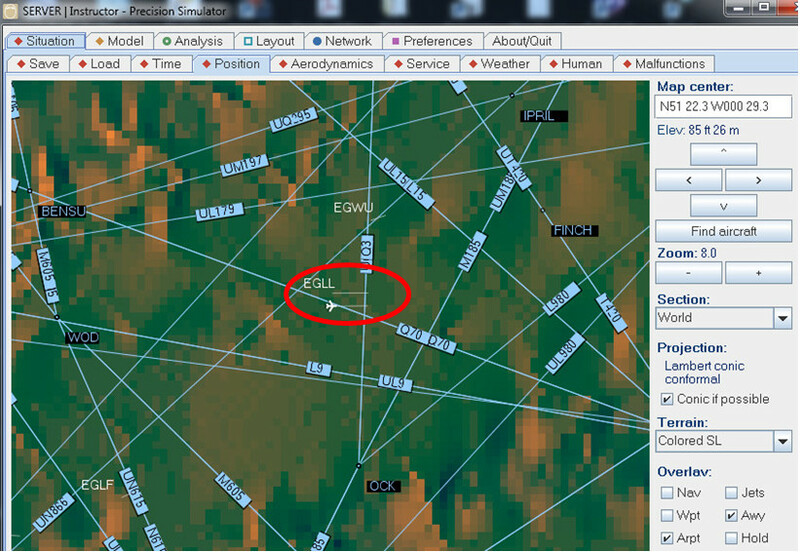 Since it incorporates its own planetary weather system, PSX can readily simulate the uploading of en route wind information directly into the FMC. It can also, when we get nearer to our destination, download the descent winds in the same way, which will improve the FMC’s calculations of ToD point and VNAV descent. In fact I’ll demonstrate the uploading of the descent wind information, once we’re in the cruise. As you can see from the above screenshot, we’re currently southwest of Manchester, approaching the NANTI waypoint and then our Top of Climb, and will be landing at Southampton in half an hour. Entering the en route winds (or rather, requesting the PSX weather HQ to upload and enter them for us) makes a big difference to the way in which the FMC can get its estimates right — without that information all it can do is to assume zero winds, which as we know is pretty unlikely, and hence without wind information its forecasts are bound to be somewhat less than accurate. But let’s skip forward to later on in the cruise, when we’re approaching our Top of Descent point. This is easy to do in PSX, since its time acceleration facilities allow acceleration of up to 64 times, or alternatively you can choose to jump straight to the next waypoint (see screenshot). If we select VNAV on the CDU and go to page 3 of 3, the FORECAST> prompt is at LSK 5R: when pressed, this will take you to the DESCENT FORECAST page. LSK 6L says REQUEST SEND, and when we press the LSK, the request for our descent winds is transmitted. We are informed when the uplink is ready, and all we have to do is to press the LSK again — the data will be uploaded into the FMC, and the VNAV calculations for the descent optimised. (Unusually, there is no need to EXECute this action, incidentally). The next picture (below) shows the PFD and ND about a third of the way though our descent: notice the vertical path deviation indicator (and the less reliable but still useful “green banana”): the FMC is now controlling our descent extremely well! 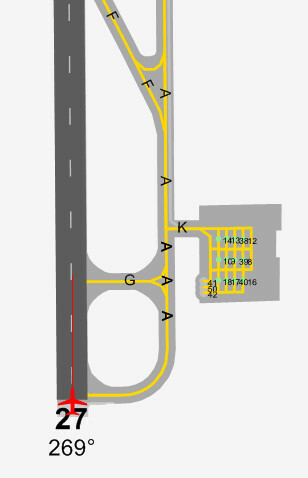 As you can see from the EFB approach page, this one of the simplest straight-in approaches that you’re ever likely to find. 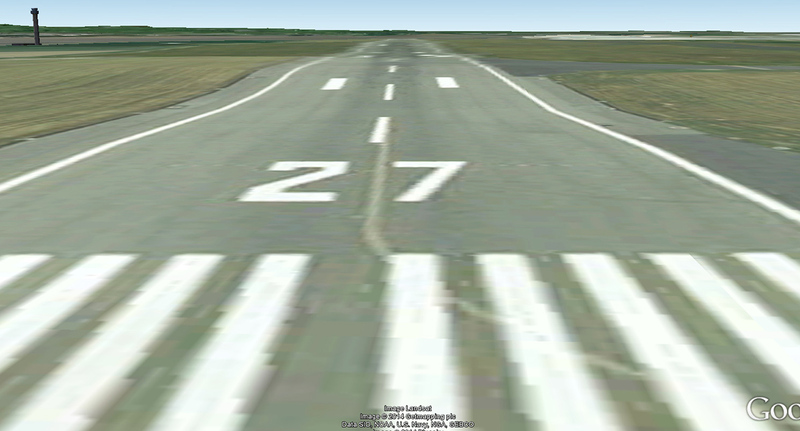 We almost fly straight onto the runway. 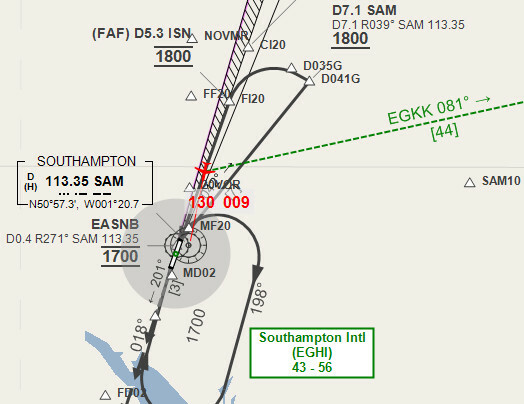 Of course, there’s always a snag, but this time it isn’t ATC — it’s the fact that runway 20 at Southampton is more than a little on the short side for a 744, with a Landing Distance Available of only 5,266 ft (1605m).... <gulp> Happily, we’re very light indeed, so with autobrakes 4 (or perhaps MAX) and the deployment of reverse thrust on landing we should be able to slow down in time to gracefully take the exit at A1 and head for the terminal. As we approach Southampton I do a little bit of heading intervention to establish us on the localizer a bit sooner than would otherwise be the case, and then capture the glideslope. Gear down, flaps 30, speedbrakes armed, VREF + 8 kts target touchdown speed, autobrakes 4, so final checks looking good: I have opted for an autoland so that I can take some pics for you on the way in with a view to comparing FSX/Orbx’s Southampton with Google Earth’s. On landing, we verify the full extension of the speedbrakes, then deploy the reversers for reverse thrust (until reaching 80 kts). You will also see (left) that we have landed with 6.1 tonnes of fuel on board, which is very close to the PFPX and TOPCAT forecast for us. As we rapidly clean up the aircraft and start the APU, we find ourselves in the perfect position to exit onto the taxyway. I had originally hoped that I might be able to give you a reasonably broad overview of the sim, but really I’ve only been able to give you a mere taste. There is just so much to PSX: it’s a vast program and I can’t hope to cover more than just a few of its extensive range of features here, let alone touch on its many extraordinarily detailed depictions of 744 systems’ behaviour. You may recall that the colourful and highly informative manual that comes with it is 600 (A4) pages long, which helps to give you some idea of the program’s scope. One aspect which I really must mention is the amazing support which is available from the Aerowinx forum. It is usual for 744-related questions to be answered with extraordinary speed, often by the developer himself, or else by another professional specialist in the field. Furthermore, the tone is entirely relaxed, supportive, and civilised. The PSX community really is a community, in fact; and being a part of it is a very significant benefit for PSX owners. But enough of the paean of praise — are there any downsides? (I did briefly refer to these earlier, but let’s explore the issues a little more, in the interests of giving a balanced review). The accurate answer has to be: for the PSX target audience of professionals, no; for some simmers — maybe. However, the advantage of the design decision to do it this way is that PSX’s frame rates are outstanding. It also takes advantage of any graphics acceleration available, so that even comparatively modest setups usually achieve the 72 fps that PSX aims to provide in order to give buttery smoothness and total control of the aircraft at all times. On the other hand, as we have seen, the ability to use external scenery generators is readily available to you at no extra cost, so if you would like to do that and have CPU cycles to spare (or perhaps multiple machines), then an external scenery generator can easily be added, either on the same machine or via a Local Area Network. Then there is the issue of cost, which is a real one, of course: whilst it is amazingly cheap for flight schools, the price of PSX is still daunting for some simmers — albeit that it is great value when you consider just how much you are getting for your money (hopefully the foregoing may have given you some indication of that). Personally, I don’t find the argument that you have probably spent far more on your fsx setup hugely helpful (for me it’s in the same ‘regrets territory’ as altitude above you, runway behind you, and fuel in the tanker) but a cool assessment of how much has been spent on FSX — and much more than FSX itself, the many add-ons that have been purchased over the years — does seem to help to put PSX’s price into perspective for some people. It’s also the case that some simmers (the flight training schools for whom PSX is intended don’t perceive this as any kind of a problem, of course) may perhaps regret the fact that PSX simulates “only” the 744 — albeit with the ability to use a full range of models and engine types so that the configuration of any real world aircraft can be replicated. The counter-argument is the complexity and completeness of the simulation, which has meant that many serious procedural simmers have been perfectly happy to exchange a plethora of ‘simulated-with-varying-degrees-of-accuracy’ aircraft for one that is completely and precisely simulated. (Hence "Precision Simulator", I guess). ● FIX INFO: Off-route entries should not blank after leg sequencing. ● IRS init check logic: another special condition. ● Takeoff TOGA push: 1 sec delay till mode engagement, 2 sec till A/T start. ● Spool-up fine tuning (aim for: 26 to 36 in 3 sec, 36 to 66 in 3 sec). ● Re-check Voice-ATC T/D detection. ● Re-check Voice-ATC approach clearance to other traffic. ● Time-jump feature should not ignore fuel ballast requirements. (*The items marked with an asterisk are ones which have been requested by real-world 744 pilots). As you can see, we are looking at a very small number of unusual conditions, or in fact a tiny number when one considers the huge number of features modelled within the aircraft. How can I bring this review to a conclusion? Well oddly enough, not in the same manner as most Mutley’s Hangar reviews, I fear, for reasons which I will now explain. It’s patently obvious that it would be foolish to attempt a straightforward comparison of PSX with other simming products since, in Mutley’s words, “There is nothing to judge it against”. PSX is a simulation for aviation professionals, as we know, but one which is also open (and, I am happy to say, friendly) to advanced flight simmers: it has a niche all its own, and that niche is an extraordinarily deep one. But as a professional product it is in a class of its own. It therefore follows that any attempt to compare it to other simming products would be invidious, which means that unfortunately none of the current Mutley’s Hangar awards are appropriate for PSX, since its detail and coverage are vastly greater (and its price correspondingly higher). This unexpected and paradoxical situation put me in mind of the white dragon tile in Mahjong — which unlike all the other colourful tiles is totally blank since it represents the highest order (and as everyone knows, white dragons are invisible). Respecting the same rationale, the only award for PSX that is available is the highest and invisible one. The remainder of my closing remarks may repeat some of the information provided above, here and there, but this is unavoidable during a summing up, so please forgive me. To do justice to PSX, permit me to first of all say this. By simmer standards, it's probably reasonable to say that I am fairly well versed in 744 lore and knowledge, having written 'The Big Tutorial' (171 A4 pages and 16 appendices) for PSX's predecessor 15 years ago, maintained a keen interest since then, and written the first two introductory tutorials for PSX (with one more to come). So it was that my first draft of this PSX review quickly began to detail some of the minutiæ of the amazing fidelity of PSX to the 744's systems — before I thought more carefully and realised that the majority of simmers (initially, at least) are probably less interested in aspects of the detailed systems logic than in how it flies, and how PSX integrates into a simmer's universe. So the over-detailed material was excised from the review and I tried again. But nonetheless, I promise you that the finer points are indubitably and substantially there: the fact that I haven't mentioned them very much is simply because I didn't want to put people off (the complexity is there when you want it, but hidden until you need it). So if you explore PSX, you will find all the depth and detail that you could possibly wish for (and that a professional 744 pilot would expect); and the fact that I have failed to convey to you the immense richness of this simulation is entirely my fault, and no possible reflection on the sim itself. (The potential length of a more detailed review was also a factor, to be fair; as was the reflection that my trilogy of tutorials will constitute a kind of extended review in themselves). Indeed, you may have noticed that I have already mentioned on the way through that in writing this review I have struggled somewhat in my attempt to cover some of the program’s high points as an indication of the quality of the whole. However, please bear in mind that this is a hugely comprehensive and wide-ranging simulation which can be used to fly to any large airport world-wide, with current weather, pushback, and ATC and other aircraft — all without needing any additional add-ons — so I fear I must leave you to discover the full range and depth of its amazing features for yourself. (Wow!). Also, as we have seen, add-ons are available for those who would like them (such as the ability to use X-Plane or FSX or Google Earth as an additional scenery generator, as well as other helpful goodies), and those add-ons are free, courtesy of the talented PSX community. PSX’s flexibility, especially in terms of screen layouts and control inputs, is outstanding; and its extensive networking abilities mean that even a shared cockpit over the Internet (including the provision of someone standing by at the Instructor Station, if you so wish) is available for those who want it. The fact that you can use PSX on any O/S which possesses the requisite Java support is, to my knowledge, unique among sims; and PSX is totally stable in all configurations, including when it is running over a network. Furthermore, you can very easily start PSX, select a Situation file, and be flying in less than 30 seconds. It is an outstanding achievement. In saying all this, however, I am deeply conscious of the fact that I am a simmer who hugely values the authenticity of my vlying (virtual flying) experience. The flight simulation community has within it enthusiasts for many different facets of this obsession hobby, from painters and decorators through to warbird fans, from video makers to bush flyers — and so I am very conscious of the fact that not everyone will share my own deep appreciation of a hugely detailed simulation that includes every circuit breaker and light bulb in the cockpit. However, those with similar tastes will, I know, understand my enthusiasm. Quite simply, if you are looking for a faithful representation of any model of the 744 — especially if you would welcome the opportunity not to be burdened by FSX and all its associated legacy of problems — you will not find the equal of PSX outside a professional Full Flight Simulator setup. This is a completely fresh approach, and one which has succeeded brilliantly. So if simulation accuracy is important to you, you really must consider PSX. Although you will need to dare to be different.